With incendiary words like these, in a 1991 speech before far-rightists and neo-Nazis, David Irving established himself as one of the world's best-known Holocaust deniers. The author of nearly 30 books, British self-styled historian Irving has made a career of claiming that Hitler knew nothing about the slaughter of six million Jews, that the Final Solution did not occur on a large scale, and that “there is not one shred of evidence” that Jews were gassed at Auschwitz. The celebrated and lengthy libel suit, decided in 2000, is the subject of DENIAL, a drama directed by Mick Jackson based on Lipstadt's 2005 memoir History on Trial: My Day in Court With a Holocaust Denier. What made the trial unusual is that under English libel law, the burden of proof is on the defense — so it was up to Lipstadt and her publisher to prove that her claims that Irving deliberately misrepresented the evidence to conform to his ideology — essentially, that he was a liar and an anti-Semite. The stakes were high — a victory for Irving would legitimize neo-Nazi ideology. Rachel Weisz plays Lipstadt, the tough-minded New York-born professor, and Timothy Spall is Irving, the self-righteous Aryan supremacist fighting for his reputation. We first meet Irving as he heckles Lipstadt in 1994 as she lectures on Holocaust denial at DeKalb College in Atlanta. Following Lipstadt's talk, Irving stands up and challenges her to a debate. “I don't debate with deniers,” Lipstadt says, any more than she debates people who claim Elvis is alive. Irving announces that he has $1,000 in his pocket for “anyone who can prove Hitler ordered the killing of the Jews.” Lipstadt's refusal to debate him, Irving says, proves that her criticism of him in her book was invalid. He then offers students free copies of his biography of Herman Göring. The film is faithful to events: Irving actually pulled this stunt. Lipstadt then learns that Irving has filed the libel suit and, despite advice from many people to settle the case, decides to fight. “I'm taking him on,” she tells her African-American colleague Libby (Nikki Amuka-Bird), whose only purpose in the film is to be Lipstadt's sounding board. Lipstadt hires British solicitor Anthony Julius (Andrew Scott), a specialist in anti-Semitism who also represented Princess Diana in her divorce, and a team is assembled of libel experts and a historian, who spend a year (two in real life) combing Irving's copious writings for evidence of his opinions and distoritions. As Lipstadt takes up temporary residence in London, where it seems always to be raining, her brash American personality clashes with the reserved Britons –— her legal team and the Jewish community leaders who fear backlash and urge her to settle the case. The Queens-born Lipstadt, though, is a fighter and will not back down. The screenplay, by playwright David Hare, makes much of this culture clash. 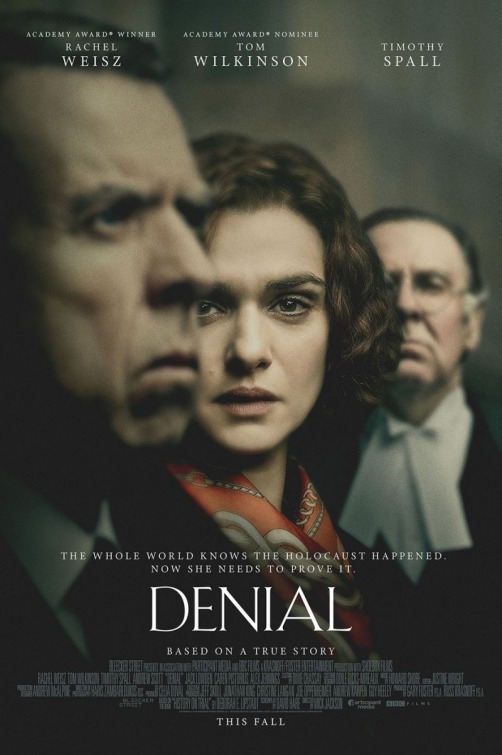 While visiting Auschwitz, Lipstadt is distressed when her barrister, Richard Rampton (Tom Wilkinson) asks dispassionate investigative questions while she, overcome by the ghosts of genocidal horror, weeps and recites a Hebrew prayer. In his defense, Rampton says, “It isn't about memorializing, it's about forensics.” Rampton does have deep feelings, it turns out, but the taciturn Scotsman drinks rather than show them. In the courthouse, a distraight Holocaust survivor approaches Lipstadt and begs her to let survivors testify. Lipstadt, deeply moved, promises her, “You will be heard.” Lawyer Julius, however, tells her survivors will not take the stand, lest Irving, who is acting as his own lawyer, try to discredit them. He shows Lipstadt a TV interview in which Irving mocked Holocaust survivors as frauds motivated by money. It's all quite appalling, and Spall does a marvelous job playing the repugnant but in some ways pathetic Irving, blustering his jowly way through a trial he has no chance of winning. The script allows Irving a humanizing moment, playing with and kissing his little daughter, though later, during the trial, we learn that he also taught the child to recite an Aryan supremacist poem. The film compresses events and leaves unanswered certain practical questions, such as how litigating in England affects Lipstadt's life or her job as a professor at Emory University. Aside from her token lady pal, has Deborah any family or friends? Knowing more about Lipstadt might make her a little more interesting. As it is, Weisz has little to work with except New York-style abrasiveness (not unlike Donald J. Trump, also from Queens). The trial, with its robed and bewigged judge and barristers, is the most interesting part of the drama, but even it is frustratingly abbreviated. They overall effect is like a movie made for TV (of which Mick Jackson has directed many). Interesting use is made of animated computer simulations of gas chamber/crematorium interiors, as well as elaborate drawings by an eyewitness, to refute Irving's claims that the buildings were actually “de-lousing” centers rather than sites of mass extermination. Irving's claims rely heavily on the discredited work of Fred A. Leuchter, which purported to prove that there were no gas chambers in Auschwitz, and who was the subject of Errol Morris' 1999 documentary Mr. Death: The Rise and Fall of Fred A. Leuchter, Jr. Denial is of a piece with WOMAN IN GOLD, another movie in which a contemporary woman takes on the Holocaust via a byzantine legal system. Neither film, in my estimation, rises to the dramatic level of Lars Kraume's thrilling LABYRINTH OF LIES, a German film about West Germany's attorney general Fritz Bauer, who overcame resistance among Germans in the late '50s and early '60s — who wanted to forget the war — to prosecute high-level Nazis for crimes against humanity. 2 3/4 out of 4 stars.